The more aware you are of your body, the more you can avoid injuries. Body awareness should never be considered an add-on to an exercise routine, but rather the foundation. Nothing will protect your back or your knees more than having the body awareness to know how to move in a protective manner. Strong but uninformed and unaware muscles are not helpful to your joints. We need our brains to understand our limits when we exercise so that we don’t strain our bodies into injury. It’s our ideas about ourselves that lead us to overstress and overuse our bodies, but our brains can also provide us with the awareness of when it’s time to stop. Not allowing time for recovery from overexercising is one of the major sources of injury and pain. Overtraining is becoming a major issue for young athletes as more and more research points to the need for rest between exercise sessions. This becomes more true as we get older. When you feel the inflammatory sore muscle effect of exercise or the achiness of your newly growing muscles, the actual growth and conditioning effects occur after the event itself, and mostly while you are sleeping. If you want to maximize the potential of your mind-body, dance and exercise in innovative ways and sleep for strength. Proprioception is your sixth sense. It refers to all the information that is poured into your brain from inside your body, telling you how you are sitting, standing, or lying and how you will need to move to get to the next position. Proprioception is what allows you to walk across a completely dark room by integrating your sense of balance with all the other input from inside your body. It is a major sense. This sense allows you to scratch an itch on your knee in exactly the right spot, even in the dark or with your eyes closed. If people drink too much, some bodily control based on proprioception is hampered. Fatigue or simple sleepiness can also make this happen. When a police officer asks a driver to close his eyes and touch his nose, he is testing the person’s proprioception. These may seem like mundane examples of what this sense does for you, but without proprioception, you would be far more helpless than if you were blind or deaf or lacking a sense of smell or taste. You wouldn’t be able to control your movements at all. You wouldn’t be able to bring food to your mouth, tend to a wound, or move your body out of danger. Strengthening the muscles of your body is a good thing, increasing your bone density is a great idea, and having the easy flexibility to perform daily tasks is useful. There are countless exercise programs to address issues of strength and flexibility. But if you want to increase the quality of your motions—that is, the smoothness of your movements, the ease in your posture, the coordination of all the parts of your body acting as a whole—you need a program that develops your proprioception, your sense of the internal, your body awareness. Improving body awareness is the key to change that leads to a more youthful body. Developing internal tools to help you notice changes gives you the chance to change your behavior in order to reduce pain and improve your ability to function. The first step in developing these internal tools is to tune in to the signal. Tuning in to the signal requires that you turn down the noise, light, and effort so that you can notice the differences that you don’t usually detect. When you do so, you will sense another body inside of yourself, and the experience is magical. Once you learn how to tune in to the signals of your body, you can sense where you feel older inside and where you feel more youthful and then make changes to your movements accordingly to keep improving as you age. My client Gary, a man in his fifties, is a great example of the dangers of exercise and the benefits of applying the concepts of increasing body awareness and exploratory learning. Gary was an avid skier and for much of his adult life had traveled throughout the world seeking the best slopes and the best snow. When he was younger, he had injured himself a couple of times, but he recovered and, of course, continued seeking snow. Though he had not been injured again, he came to me with new pains in his back and a frozen shoulder, which had practically immobilized him and made him wonder whether he might have to stop skiing that season. His frozen shoulder was a result of his joint becoming unstable. Many people experience pain from exercises or sports because their brain can’t organize the muscles close to the joint, which serve to stabilize the joint during any activity. I worked with his balance, which is so important to maintain as we age. Gary had never realized the many differences between his left and right sides. He saw that he was using his right arm with the ski poles very differently than the way he used his left arm. He knew he was better able to turn on his skis to one side but didn’t understand why—he didn’t understand how his body parts turned differently or balanced differently on one side compared to another. Gary’s shoulder injury was a complete mystery to him, since no incident had occurred that would have particularly aggravated his right shoulder. I helped him feel, from the inside, how he was moving his trunk. Away from the stress of both skiing and his off-season exercising, he was able to sense much finer and subtler movements. Once Gary learned how to tune in to the right signal, he had a much more refined sense of how he used his body on the left side, how he used it on the right side, and how he moved from left to right. Once he could sense more subtle movements and tensions in his body, Gary could then learn to alter those tensions, as well as the basic physical habits of a lifetime. For him, this revelation was like magic. His frozen shoulder disappeared as he regained full use of it, and his back pain disappeared as well. Gary had learned that he was working his muscles with too much force in an attempt to ski the same way he did when he was young. No ski coaches had been able to help him because his problem was an “inside job.” To celebrate solving that problem, Gary joined a team of his friends the next winter and was dropped by helicopter onto the Columbia ice fields. An exploratory movement is a movement you perform when you don’t know exactly what you are going to do so you have to think about it and feel your way through it. One example of exploratory movement is the kind of movement we all performed as babies trying to find where our hands, mouth, and feet were. Much more of your brain is used, and a far larger range of neurons are activated, when you’re exploring a movement. As you keep practicing what you already know—that is, doing performatory movements—you use fewer new neuromuscular connections. I call this combination of simultaneously thinking and feeling as you move “flinking,” as a way to urge my students not to compartmentalize these mental and physical activities. As happened when you were a child, the greater the area of your brain that’s involved in your movements, the more fit your brain becomes and the more it retains and generates new neural connections. The more you use your body awareness, the more you integrate the body and mind and the more proficient your movements and actions become. For example, imagine that you are preparing to do a dead lift—lifting a weight off the floor until you are standing. If you are like most people, you have one way of performing this action and think that, if you made your muscles stronger, you could lift more weight. However, a completely different and healthier approach would be to explore how many ways you can coordinate your pelvis, legs, arms, and shoulders as well as your balance, timing, and breathing—in other words, your whole body—to lift the weight. This approach would make you not only stronger but better able to bend down and pick up anything, because you would have expanded your neuromuscular repertoire for bending over to pick things up. The Change Your Age Program encourages the growth of your brain by having you use nonlinear movements like the ones you explored regularly when you were younger. Many of us are trapped in a rigid way of learning with our current fitness routines. Some of us fixate on targeting specific muscle areas (to get that hard-body look, for example) or on specific joint actions (perhaps to perfect a tennis serve) instead of paying attention to how the whole system works in an integrated manner. Proprioceptive awareness can fade into the background and become irrelevant to the way we exercise. Without this awareness, we lose out on the important information it delivers that could help us avoid pain, stiffness, and injuries. Additionally, exercise equipment is designed in a way to make bodies move in a machine-like fashion: on a single plane of action, up and down or side to side. The nature of exercise on these machines becomes linear movement, which is very different from the nonlinear ways in which we normally move—for example, as we reach for things that are a little off to the side, or twist our trunk to turn toward a friend while walking. In fact, many people with strong backs injure themselves and get incapacitating back spasms because they do a simple movement—such as retrieving a dropped dinner napkin at an angle and with a spinal twist—that they have never explored while exercising! We rarely see twists, torques, and asymmetrical movements in exercise routines because, as people get older, they lose their ability to perform these kinds of movements. Older people who can spiral, twist, and move on strong diagonals always appear to be much younger than they are. Remember Tina Turner performing at her concerts when she was in her fifties? Or the Rolling Stones going on and on, performing nonlinear movements on-stage at an age when most people have retired? Because of this tendency to practice movements that target only partial areas of muscles and strengthen only partial areas of the bones, ligaments, and tendons, adults often engage not just a narrow area of their bodies but also only a narrow portion of their neurons. Their ability to learn is limited. Infants and children, on the other hand, practice movement and learn in a very different way. Babies and young children exploring the environment reach and twist, shift and fall back. Those exploratory movements require the full use of the whole body, not just a good set of abs or a perfectly functioning shoulder joint. As you age, it is crucial to return to moving like a child and learning like a child in this exploratory and nonlinear fashion. 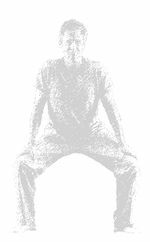 You don’t need to avoid linear movement—in fact, many common daily activities are linear movements—but if you want to expand the range and repertoire of your movements and feel real pleasure and sensuality in your movements, you’ll find it valuable to practice nonlinear and exploratory movements. It really is possible to regain youth and vitality through body awareness and movement. You don’t have to give up your exercise routines, but there are many valuable modifications you can make to help you get the most out of them.